Children do not often attend dinner parties. Adults with children typically leave the kids with a babysitter when attending a dinner parties with colleagues or friends. But some hosts choose to make their dinner parties kid-friendly. This can make things easier on guests, who won’t have to go to the trouble or expense of hiring a babysitter for the night. It also can make things easier on hosts with children of their own and don’t want to add finding a sitter to their list of things to do in the days leading up to the party. Kids can add some life to a dinner party, but hosts may to employ a few strategies to ensure their kid-friendly dinner parties are enjoyable for adults and children alike. * Feed the kids first. Kids can’t ignore their appetites as long as their adult counterparts, so make sure dinner for the kids is served once all of them have arrived. 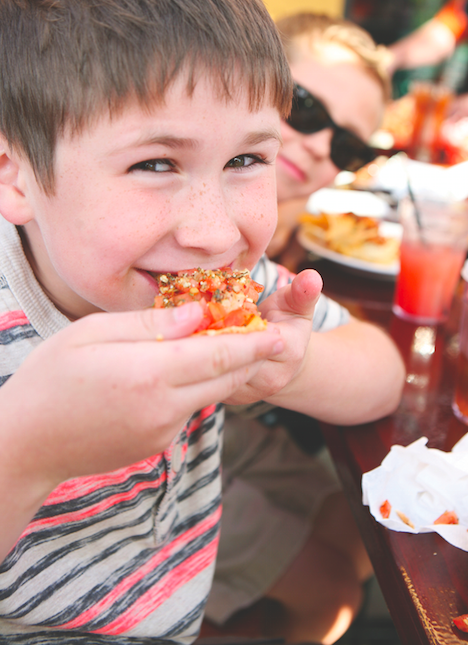 Choose kid-friendly fare like pizza or macaroni and cheese so kids are more likely to eat and not complain of hunger later in the evening. Feeding the kids first also makes it easier for adults to enjoy uninterrupted conversation when it’s their turn to sit down and eat. * Keep the kids entertained. Whether it’s a movie, a board game or another distraction, finding something to keep the kids entertained throughout the night should be a priority for hosts. A selection of movies that kids can choose from might be your best bet, as films that are between 90 and 120 minutes long can keep youngsters occupied for much of the night. Let kids watch their movies in a playroom that’s separate from where adult guests will be gathering prior to dinner, and periodically check in on the kids as the night progresses. Provide some snacks like popcorn or even some candy to create a night at the movies atmosphere for kids. * Remind kids to be gracious hosts. When choosing activities for kids, remind your own children that it’s their responsibility to be gracious hosts, even if that means playing games they aren’t interested in or watching movies they have already seen. Let youngsters know in advance that if they fulfill their responsibilities at hosts they can choose how to spend the following day or weekend. * Choose an adult entree that’s simple to prepare. No matter how well behaved kids may be before and during a dinner party, hosts should not add to their already considerable workload by preparing an especially complicated meal for their adult guests. Keep things simple, especially if you are preparing a separate meal for the kids. Much of the stress of hosting a dinner party comes with preparing the meal, and that may only prove more stressful if you are preparing two meals while simultaneously catering to the needs of your youngest guests. * Consider hiring a babysitter. Sometimes hiring a babysitter makes sense even when mom and dad are home. A babysitter can look after the kids while the parents are elsewhere in the home enjoying a good meal and great company. Adults attending the party with their children can split the cost of a babysitter, even if he or she charges extra to look after several kids at once. Hosting a kid-friendly dinner party can make for a memorable night for parents and their children. Hosts can make the night even better by employing several strategies to make the party feel like a more traditional affair even if the kids are in the next room.